Google penalize websites that it feels violate norms of quality content. Such a penalty can decrease your search traffic. Learn if you’ve been punished! Google, the search king of Internet, keeps enhancing its search algorithm in order to serve better search results to the users. These enhancements come as various updates in Google search. Panda, Penguin and Hummingbird have been a few of such updates in recent times. As Google strives to improve its search capability –these changes may (and often do!) cause a lot of havoc in the world of web. These search engine updates may target and punish certain characteristics of websites which Google believes are a hindrance in achieving good search results. Besides its state- of-the-art crawlers and search algorithms that decide which websites have good content, Google also employs a team of human reviewers who visit various websites and assess them. If these reviewers find that a website is violating qualities of good content –they manually mark the said website as bad. Websites containing explicit adult content, copied content and low quality information invite such an action. Google, however, uses this option very rarely as it prefers to rely on its algorithms to decide about the content quality. But whenever a website is handed manual penalty –it very badly effects the performance of the punished website in Google’s search results. The impact may range from decrease in ranking to complete removal of the website from Google’s index. 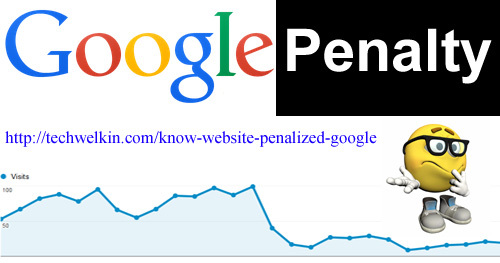 Penalty from Google can decrease your search traffic and confuse you! Earlier, webmasters needed to contact Google’s support team to know if their websites have been manually penalized. But now information in this regard is available through Google Webmaster Tools. To find out, just log into your GWT dashboard go to Search Traffic menu and then to Manual Actions. If you see a message there –you should be very concerned about the health of your website. Unlike manual actions, it is not easy to find out if your website has been penalized due to an algorithmic update. But if you see a drastic and sudden decrease in search traffic within a few days after Google announces an update –it is probable that you might have been punished for something. To find the exact cause of punishment you’ll have to do research. Read posts from tech blogger on the effects of the said update and see what causes they are guessing. You should also read Google’s statement regarding the update. They might mention what kind of characteristic have targeted by the update. Just to highlight the relation between algorithm update and target characteristics –the Panda update in April 2012 roughly targeted websites with duplicate content. So, all those websites that had duplicate content lost out on search traffic from Google. Interesting thing is that there were also thousands of good websites among the punished ones! This was because webmasters of these good websites unknowingly had created duplicate URLs. Duplicate URLs are distinct URLs but they access the same piece of content. Earlier webmasters were not much concerned about such inadvertent duplicates –but after Panda update everyone woke up to a rude shock. When these duplicate URLs were removed by the website owners –their search traffic bounced back to normal. It is very important that you keep a close eye of your search traffic and take notice of any uncommon decrease. If such a thing happen, you should seriously consider the possibility of a penalty from Google. Let me know how has been your experience in this regard. Have you ever felt an unexplained drastic decrease in search traffic? Share with us, sharing knowledge is refining knowledge! If my blog is mobile compatible, then there is duplicate URL generated for mobile and desktop. Will it be counted in google penality? Yes, if you have different URLs for the same content, it will create duplicate content problem. You should opt for a responsive theme which can adjust itself according to the screen width.